Home > Departments > Faculty > James McDermott Ed.D. 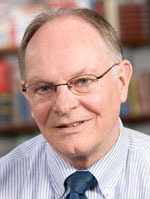 James E. McDermott earned his Ed.D. at Clark University, M.A. in English Literature at Clark University, and his B.A. in English Literature at the College of the Holy Cross. Dr. McDermott is a former Massachusetts State Teacher of the Year who has taught English, writing, and drama, as well as coaching championship teams in baseball. He has worked exclusively with urban students in grades 7-12 over the course of his thirty-four year career. He is co-founder and co-director of the Central Massachusetts Writing Project, and for seven years served as the English Language Arts Liaison for the City of Worcester, during which time he led the task force for developing an articulated K-12, portfolio-driven curriculum. He served as a leading member of the Massachusetts State Curriculum Framework and Assessment Development Committees. Dr. McDermott's clinical work focuses on schools in the Hiatt - Main South Secondary School Collaborative: University Park Campus School (where he taught for six years, creating the secondary English program), South High Community School (where he taught and coached for twenty-five years), and the new secondary Claremont Academy. Professor McDermott works with M.A. and M.A.T. students, supervising and facilitating on-site seminars for students and for teachers. He encourages student teachers to develop classrooms that engage all urban students in rigorous content in a warm and inviting environment. Reading, writing and thinking are at the center of Dr. McDermott's pedagogy. Dr. McDermott has presented numerous workshops locally and nationally. His focus is on creating classrooms that engage all students as thinking and feeling human beings through using low stakes writing to help even the most at-risk students to think deeply and to understand rigorous content. He is past co-chairperson of staff development for the Foundation of California Community Colleges.